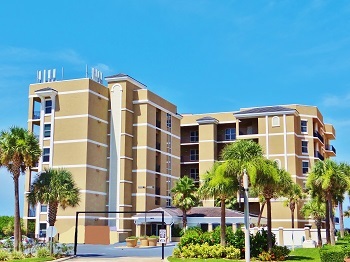 St Kitts was built by Cook Development and is one of the most exclusive Daytona Beach Shores condos on the drive beach of the Atlantic Ocean! This prestigious complex offers 3 bedroom units with over 2300 sqft or living space. Private wrap around balconies provide great ocean and river views. 10 ft high ceilings, granite, crown molding, and pre wired surround sound are typical upgrades for all units. This 6 story, 24 unit complex has a strict 1 year minimum rental policy to keep the complex very private. Bring large pets up to 60 lbs! If you are looking for ultimate privacy, units on the North side of the building have no exposure to any other building and provide views that travel forever down the coastline.